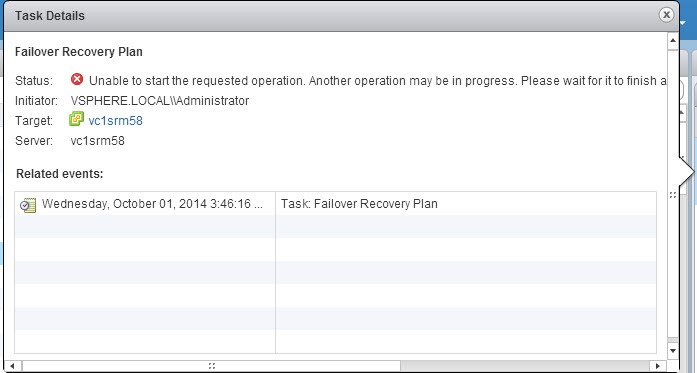 The other day I stumbled upon a new VMware labs “Fling” called PowerActions. Basically it allows you to run in-context PowerShell/PowerCLI scripts right from within the vSphere Web Client. My mouth drooled at the promise of what this could deliver–and it really delivered! This is my new favorite tool by a landslide. See the announcement here from @alanrenouf http://www.virtu-al.net/2014/09/16/powercli-vsphere-web-clientannouncing-poweractions/. I’d recommend readin this first before you continue down with my post. Quick post here. So I have been reviewing some great posts from @vmKen and @BenMeadowcroft about automating Site Recovery Manager operations with PowerCLI and wanted to give it a try myself. They outlined the process rather clearly in their blogs so it was a breeze to get most of the stuff up and running. But when I went to actually execute a test recovery or a recovery etc. it kept failing! The PowerCLI command to start the recovery was $VMrp.Start($RPmode)–the $VMrp being my recovery plan and the $RPMode being the recovery plan mode of a recovery. The command was accepted but the recovery plan never started. Unable to start the requested operation. Another operation may be in progress. Please wait for it to finish and try again. Hmm…weird. I could kick off a test from the GUI with no issue so nothing was “interfering” from what I could tell. I thought maybe since I was using Site Recovery Manager 5.8 maybe something had changed so I tried it with my 5.5 environment and got the same result. After I was about to lose my mind it finally occurred to me that I was connecting to the protected vCenter and the protected SRM server (I did enter in remote credentials for the recovery SRM server though). 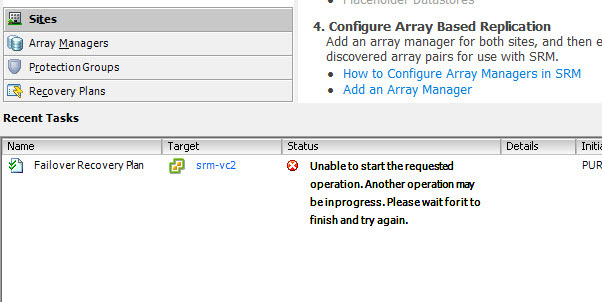 While I could query the recovery plan etc without issue from here, maybe SRM didn’t allow a recovery plan to be started unless you directly connected to the recovery vCenter/SRM server. So I reconnected to the recovery site and it worked! So I guess it makes a difference, so FYI. Now there might be a workaround to this and it is definitely possible I missed something that allows this but this seems to be what you need to do. If you find this isn’t true please let me know!